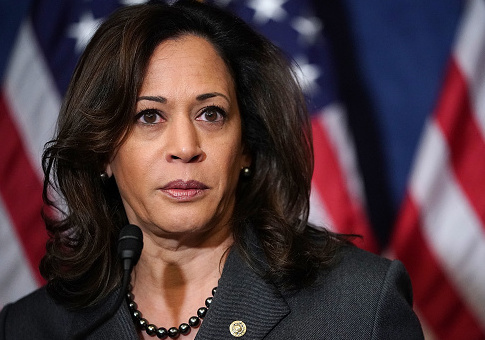 Sen. Kamala Harris (D., Calif.) supported a 2008 San Francisco policy requiring law enforcement to report undocumented juvenile immigrants to federal authorities if they were arrested and suspected of committing a felony, whether or not they were convicted. As district attorney for San Francisco, Harris sided with then-Mayor Gavin Newsom in support of his policy of reporting juvenile immigrants arrested by local police to Immigration and Customs Enforcement (ICE), CNN reports. Harris, in her role, was responsible for prosecuting crimes in the city. The policy was opposed by the city's Board of Supervisors. San Francisco became a sanctuary city in 1989, which meant law enforcement was not required to share information with ICE about undocumented immigrants living in the city. In 1992, the city changed its policy to lift protections for criminal adult suspects. In 2008, a 21-year-old undocumented immigrant named Edwin Ramos was arrested for committing three murders. Ramos had been arrested when he was 17 and found guilty of attempted robbery, but he was not reported to federal authorities. After the murders, Newsom further amended the policy to allow police to report arrested undocumented juveniles to ICE. At the time, Harris issued a statement saying the city's sanctuary law "was never intended to shield anyone from being held accountable for a crime. It's intended to encourage immigrant victims and witnesses to report crimes without fear of reprisal so we can hold offenders accountable." Over the first year of the policy, more than 100 juveniles were reported to federal officials for deportation. In one case, a 13-year-old faced deportation after he punched a boy at school and stole 46 cents. The Board of Supervisors passed legislation that said youths could only be reported if they were convicted of a felony, but Newsom vetoed the measure. He did not abide by the legislation even after the board overrode his veto. Harris continued to support Newsom and said she thought the board's measure would fail in court, although it has never faced a legal challenge. Newsom's successor revised his policy to curtail reporting to ICE, and in 2013, the city restricted the reporting of almost any arrested individual. After Newsom left office in 2011, his successor changed the city's policy again so that law enforcement would only report undocumented juvenile immigrants who were arrested to ICE if they couldn't prove family ties to the Bay Area, leading to a sharp drop in reporting. In 2013, San Francisco passed another ordinance which prohibited reporting any arrested person to ICE except in limited circumstances. Harris campaign spokesman Ian Sams told CNN that the "policy was intended to protect the sanctuary status of San Francisco and to ensure local police, who needed to have strong relationships with the communities they serve regardless of immigration status, were not forced to operate as immigration agents, which is the responsibility of the federal government. Looking back, this policy could have been applied more fairly." The 2020 hopeful has been less supportive of the agency over the past year. She said during multiple interviews in June that the government "maybe" or "probably" should "start from scratch" with ICE. While speaking during a November confirmation hearing for President Donald Trump's nominee to head ICE, Harris compared the agency to the Ku Klux Klan. This entry was posted in Politics and tagged 2020 Election, California, Gavin Newsom, Kamala Harris. Bookmark the permalink.